If you know NASCAR, you know Richard Childress Racing. Founded in 1969, RCR is one of the largest and most storied organizations in the sport. 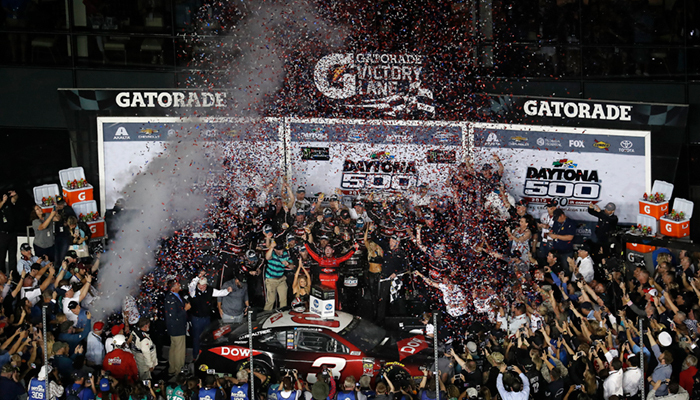 RCR has accumulated a total of 17championships and more than 200 victories across NASCAR’s top three series, including three Daytona 500 wins, and three Brickyard 400 victories. Today’s racecars regularly approach speeds up to 200 mph for the duration of a 500-mile race. More often than not, the difference between 1st and 2nd place is measured in hundredths of a second. The journey to Victory Lane is not easy, nor is it just a weekend effort. Success is found during the work week in an unending cycle of design improvement, engineering effort and quick response manufacturing. RCR designs and builds race cars and engines from the ground up at its 15 building, 500,000 square foot campus outside of Winston-Salem, NC. To ensure ongoing success, RCR progressively became a fully-integrated manufacturing organization and developed a culture focused on innovation, improvement, and precision. This vertical approach gives them the broad set of capabilities to handle complex motorsport requirements. It’s with this wide range of expertise that RCR is able to design, manufacture and assemble the 3,500 parts required to build the race cars. They use everything from aluminum to titanium to in-house developed material. Its normal to have design changes, implemented and tested in days – and at times, hours – so that project builds stay on time. Something that requires a level of ability and efficiency not everyone is capable of. All of this is done with an endless drive towards better performance, better durability, improved manufacturing efficiency and to achieve zero-defect part manufacturing. It is RCR’s belief that their approach can be translated to other industries. 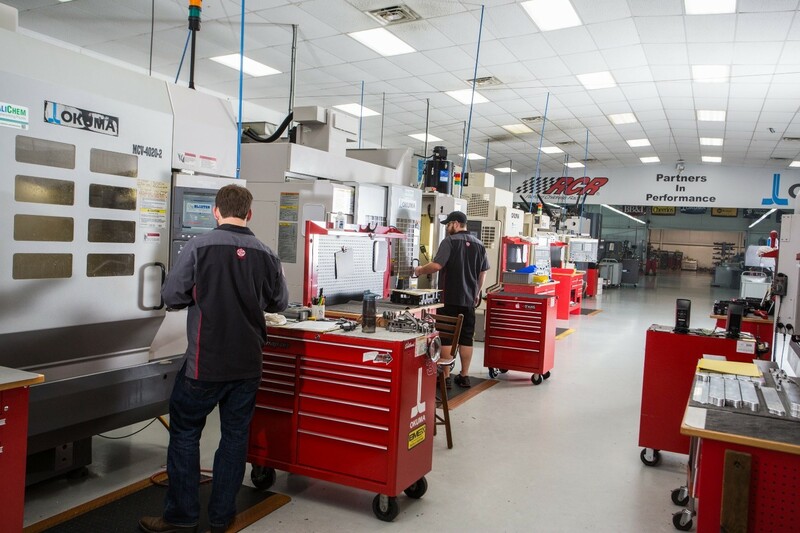 While there may be shops that have parts of the RCR capability set there are very few that have them all under one roof, even fewer bring the experience and culture of RCR. To capitalize on outside opportunities, Richard Childress Racing Manufacturing Solutions (RCRMS) was born. The goals of the division were simple: bring the precision and nimbleness of the NASCAR supply chain to other industries, and leverage existing assets into a new revenue stream. 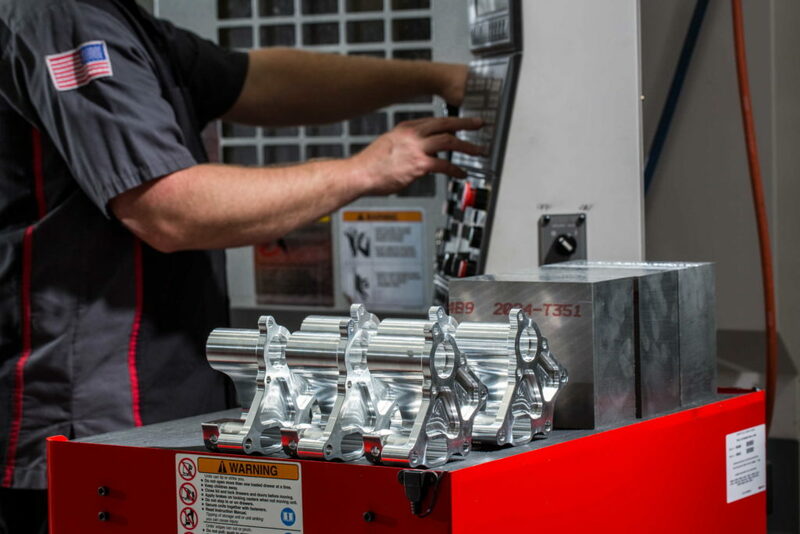 I’ve been around the machining and fabrication industry for a long time and have interacted with hundreds of machine and fabrication shops over the years. The fact is, some companies have a good story to tell, others don’t. RCR has a great story. I asked Mike Brown, VP of Outside Services at RCR, about RCRMS’s origin. “We developed a marketing strategy shortly thereafter and began to look for opportunities in the US Military. After having success manufacturing weapons, weapon mount and other components – including assemblies for aircraft – we began to look for opportunities outside the defense market. Today, we have a broad focus across military, aerospace, automotive and other areas. Ultimately, everything we do goes back to support the race team. Whether it is two-way technology transfer or adding value to our sponsor base, everything we do must be additive to the motorsports side. “RCR’s reputation was built on the backbone of its motorsports effort, but when you look past our weekend work we are really a component development and vertical manufacturer. Sure, we race on Sunday, but the other six days a week we apply our highly technical expertise to design management, engineering, fabrication, manufacturing, and assembly. Its manufacturing team also leverages relationships developed through the motorsports business which provide unique benefits. They’ve established key technical partnerships with companies like DOW, Sodick, Omax, PTC, and Kennametal to help develop new technology. Final inspection takes place in a Zeiss Class 6 Clean Room which uses the latest Zeiss CMMs and visualization equipment, which helps RCMS internal quality standards meet or exceed ISO 9001:2008 and AS9100 Rev C standards. On the machining side, RCR partnered with Okuma America Corporation, a world leader in the development of CNC machining technology. RCRMS utilizes equipment like Okuma’s 5-axis mills that enable the machining of extremely complex geometries under synchronous control. Okuma also delivers 9-axis mill/turn centers that enable complex parts to be manufactured complete in a singular set-up. High accuracy, repeatability, and the elimination of setups, manual loading, and unloading translate into better efficiency. 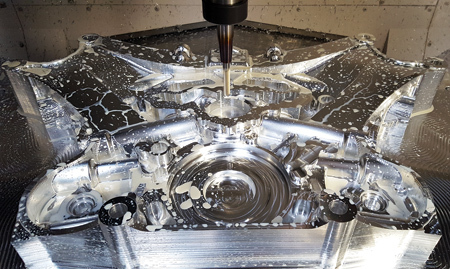 The companies often collaborate to solve a machining challenge by building one-of-a-kind solutions that are evaluated and tested before being made available to a larger audience. The relationship provides value to both partners. 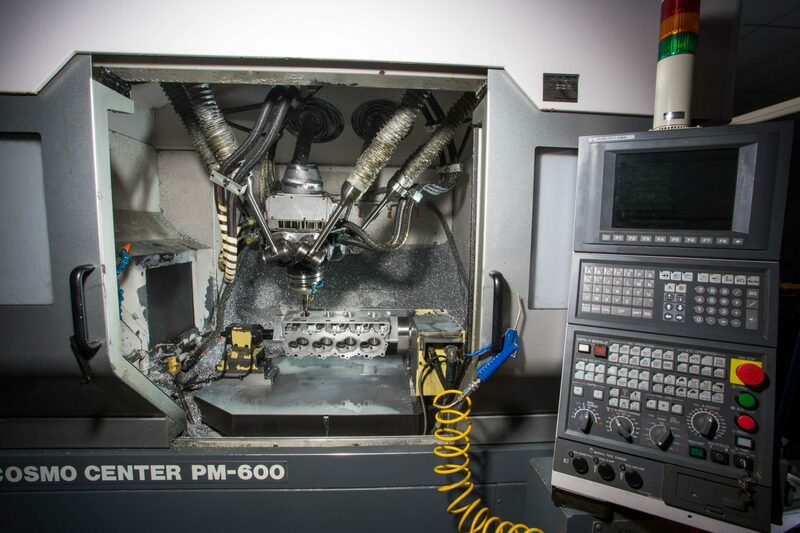 RCR benefits from access to the latest equipment, Okuma America receives valuable feedback on machine performance and can use RCR to show tangible real-world benefits to other customers. To raise their industry profile and reach a broad buyer market, RCRMS turned to SourceHorizon MFG. SourceHorizon is a sales and marketing firm that specializes in the manufacturing sector. 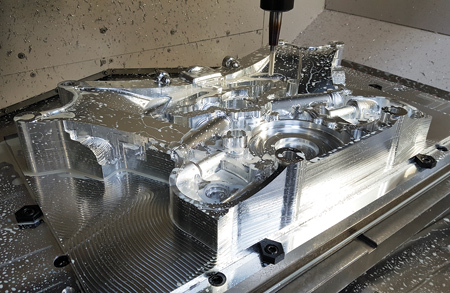 The company has developed an Advanced Manufacturing Supplier Network that consists of world-class suppliers of CNC machining, metal fabrication, design-and-build, and build-to-print services. Member companies are promoted online and through highly targeted sales campaigns. Through SourceHorizon and the Advanced Manufacturing Supplier Network, RCRMS has gained access to motivated buyers and a steady stream of Request for Quote opportunities which matches RCRMS’s strengths and goals. Mike Brown of RCRMS had this to say about the relationship. Rick Gilmore, Director of Supplier Development, at SourceHorizon had this to say about the company’s relationship with RCRMS. Whether they’re building race cars, turrets or flight simulator assemblies, everything that is produced at RCRMS is subjected to the same rigid quality standards. By integrating their broad technical competencies with a nimble manufacturing organization, RCRMS goes from concept to the finished product in timetables not available from typical organizations. When working with companies outside of motorsports, the idea is simple: take RCR’s race knowledge and ability and apply it to building the parts and components for others. With multiple, well-qualified sources for CNC machining, metal fabrication, design-and-build and build-to-print services, SourceHorizon can help you find the right supplier for your project. Like you, SourceHorizon vets our suppliers to make sure that they’re financially sound, have world-class quality systems and a history of delivering quality parts on-time. Everything that you would expect from your suppliers.